Yesterday evening (29 Oct 2015) I was a guest in the Live broadcast TV show "Z Today" by Dutch commercial broadcaster RTL Z. 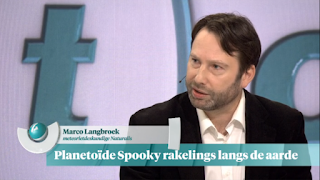 Topic was the close approach of the 200-600 meter large asteroid 2015 TB145 (with the unofficial nickname "Spooky") which comes to within 1.25 Lunar Distances on 31 October 2015. 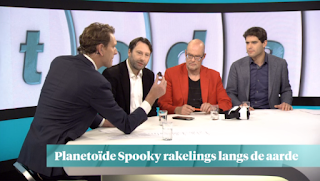 The item is 8 minutes (and in Dutch, of course). Embedding the video in this post won't work for some odd reason, but here is a link to it. On October 8th 2015, an Atlas V rocket launched the National Reconnaissance Office's NROL-55 mission from Vandenberg AFB. The mission consisted of two NRO payloads and a number of cubesats hitching a ride. The two NRO payloads (of which only one is acknowledged, the other being catalogued as 'debris', which it isn't) are a new NOSS pair, NOSS 3-7, which replaces the 10-year-old NOSS 3-3 duo (2005-004A and C). NOSS (Naval Ocean Surveillance System) satellites operate in pairs, flying in close formation. They geolocate ships by radio interferometry observations of the ship's radio and radar signals. 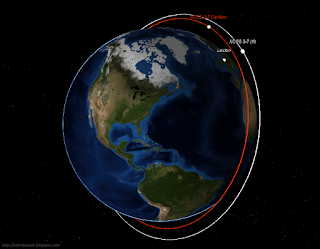 Based on the launch direction and rocket used, as well as the few details published, we knew it would be a new NOSS duo, and from previous launches had an idea in what orbit they would be launched and what manoeuvering sequence would be used. The first observations of the newly launched objects were made within a few hours after the launch, by several observers. About 1.5 hours after the launch, observers in Iran and Tibet witnessed a spectacular fuel vent by the Centaur rocket from the launch. Next a number of satellite trackers in our network observed the payloads and the Centaur rocket (e.g. here, here, and here). I was clouded out on Oct 8. 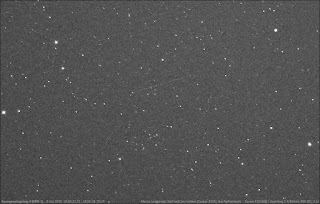 I could join in the chase and got my first look at the payloads only on the next evening on the 9th, but under poor conditions (very hazy) with the objects only marginally showing up on my imagery made with a 2.5/50 mm lens. 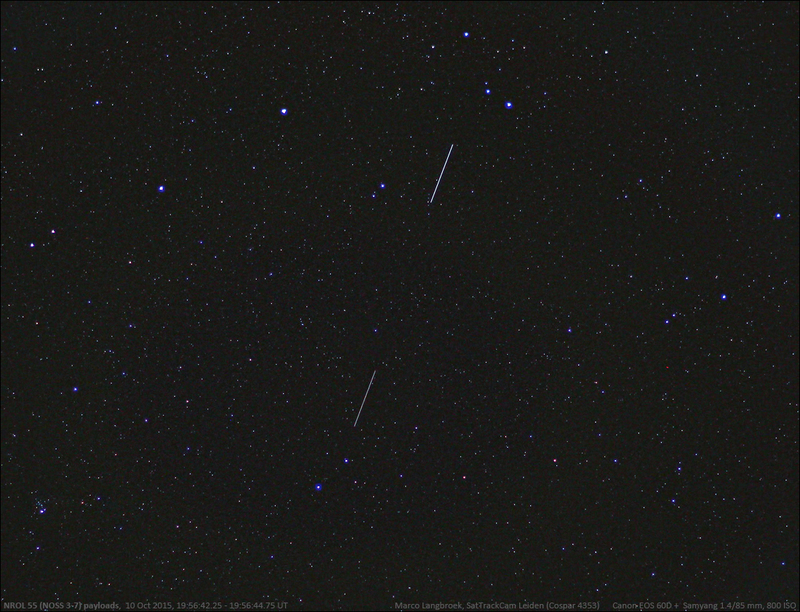 Next I observed the two payloads closely chasing each other near 19:55 UT. 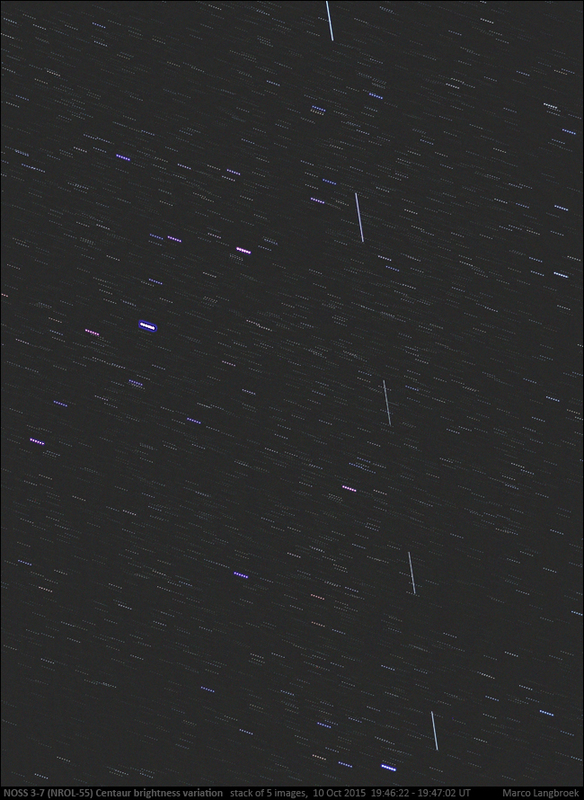 Like the previous evening, the leading object was clearly fainter than the following object (movement is from top to bottom in the image below, showing the two payloads crossing a part of Cassiopeia). 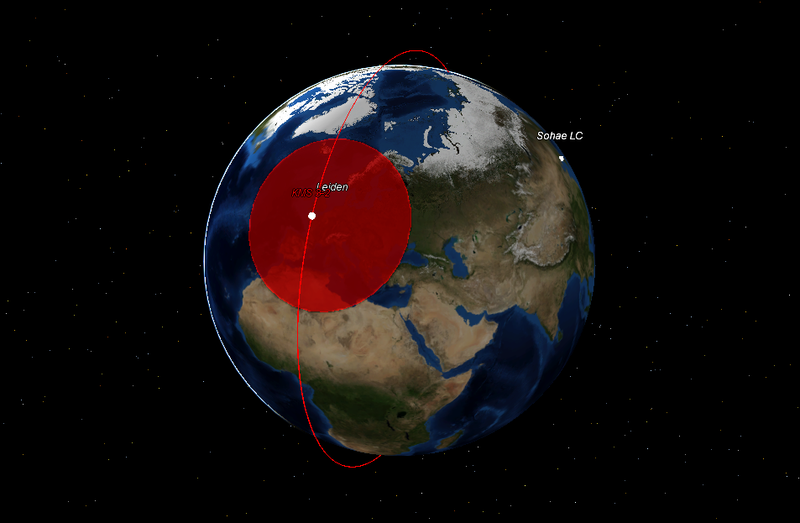 NOSS pairs operate for about 10 years, each pair maintaining a close spatial proximity configuration of parallel orbits with one satellite just leading the other. After 10 years their mission is over and the pair loses their close spatial proximity. From previous patterns, Ted Molczan expects that the NOSS pair that is being replaced by this new launch (NOSS 3-3, 2005-004 A and C, launched in 2005) will end its mission and lose their close spatial proximity about 7-8 months from now, i.e. around April-May 2016. The newly launched NOSS 3-7 duo is not yet at its operational orbit in its operational configuration. 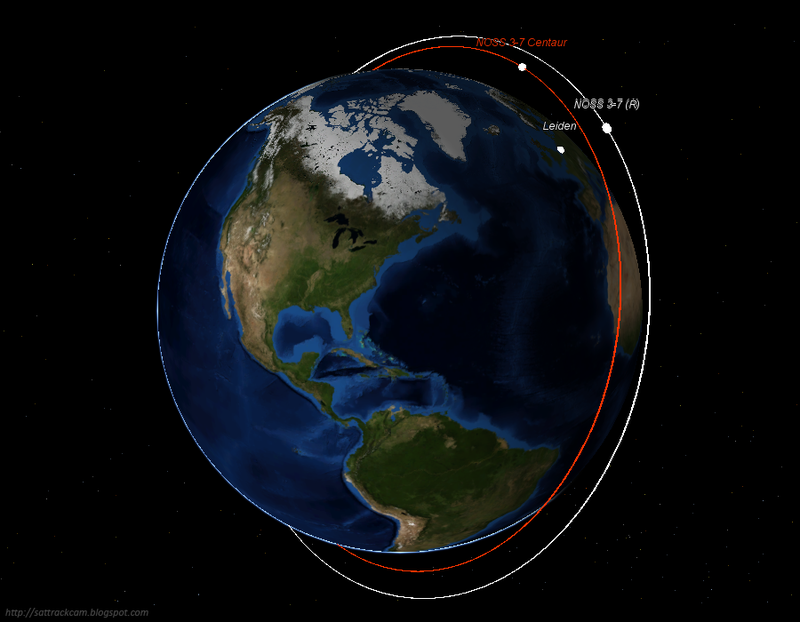 Based on past missions, they will continue to manoeuver the next few weeks until they reach their operational orbits (after which a check-out period will follow). This manoeuvering makes them interesting targets to follow the coming few weeks. 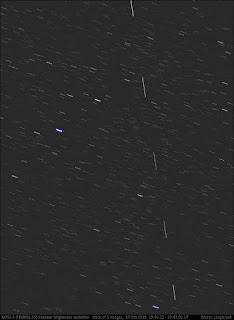 The image at the top of this post shows the pair of payloads (moving top to bottom through Cassiopeia in the image), with the leading object being slightly fainter than the trailing object. This is a pattern also seen with previous launches: once operational, both payloads will however be of similar brightness. 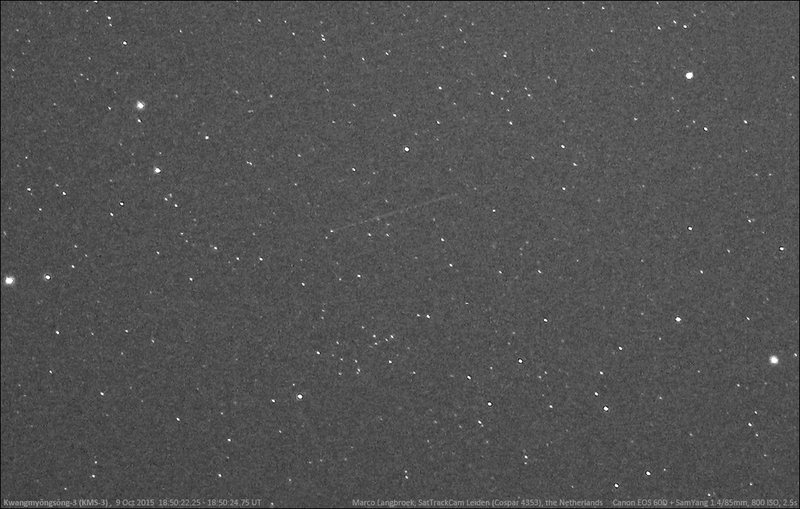 I imaged Kwangmyŏngsŏng-3 again the next evening (image above), 10 Oct 2015 near 18:32 UT, when it passed the bright star Deneb (brightest star in image). 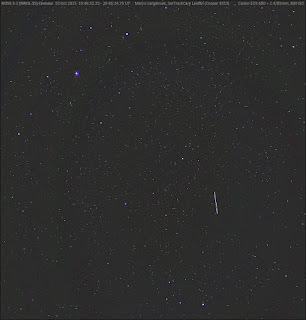 This time I used the Zeiss Sonnar MC 2.8/180mm lens, which shows fainter objects but has an even smaller FOV. 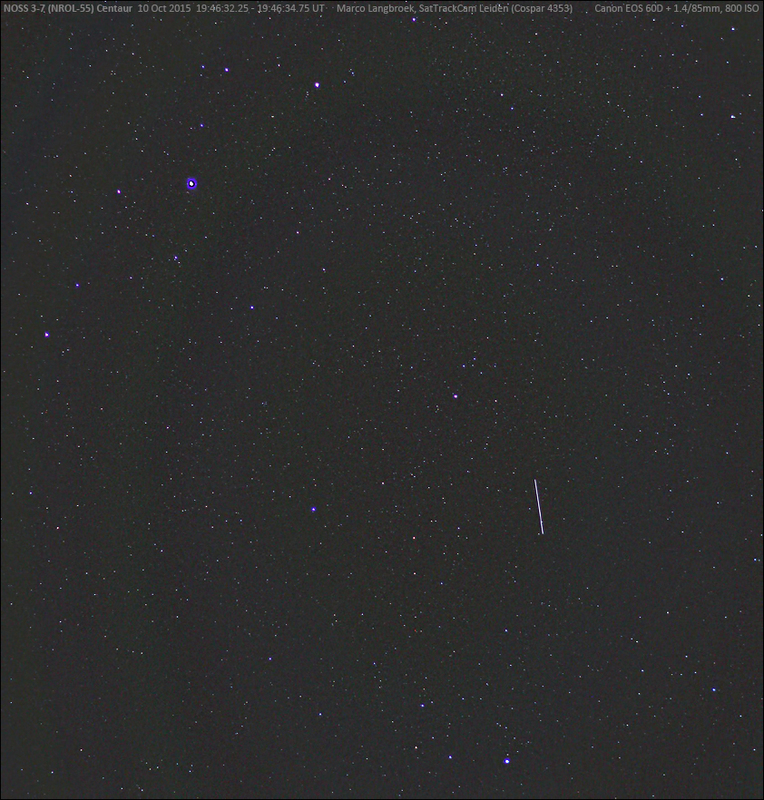 The trail is faint but shows up well (click the image to enlarge). [original post before update:] Yesterday evening started clear. While my targets for that evening were the payloads of the NROL-55 launch from October 8 (more on that in a later post), I took the opportunity to image a pass of North-Korea's satellite Kwangmyŏngsŏng-3 (KMS 3-2) in the early part of the evening. 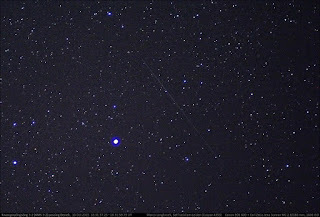 The image above shows it, as a very faint trail. Kwangmyŏngsŏng-3 (2012-072A) makes favourable passes in early autumn and in spring. In October it is making evening passes. Yesterday I had a very good illuminated pass near 20:50 local time (18:50 UT). By coincidence my imaging of KMS 3-2 yesterday happened on the eve of the 70th anniversary of the Worker’s Party of Korea. There were rumours of a pending new N-Korean satellite launch, perhaps with a stronger rocket, on or near that date, although at least one assessment of satellite imagery by the 38 North blog, suggests the new launch platform at Sohae, which North-Korea has been building the past year, is far from ready yet. 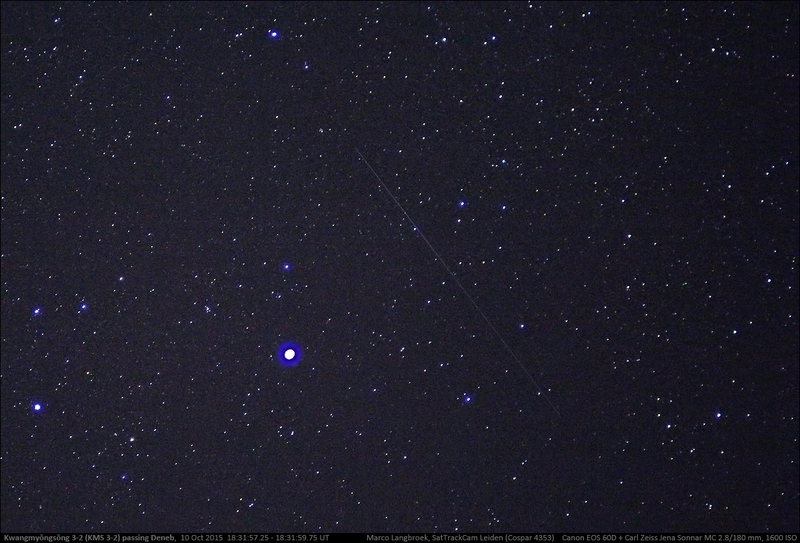 KMS 3-2 is a difficult object to photograph, as it is very faint: it is a cube of only about 1.0 x 0.75 meter in size. It is also tumbling. This makes it a challenge: it is in a Low Earth Orbit and moving relatively fast, but a lens which is fast enough to capture it during it's brief brightness peaks has a limited FOV. In practise, my f1.4/85mm lens can just show it during the brightest part of it's periodic brightness variability, but it is a gamble whether that happens in the FOV or not. So far I had managed to image it once before, a year ago. 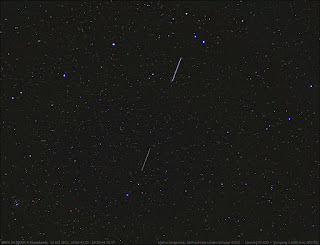 Yesterday evening, I was lucky again: during a nice high late twilight pass with the the satellite culminating at an elevation of 60 degrees in the W-SW, it did reach peak brightness in the FOV of my lens, resulting in four images showing it. The best of these is shown above. Kwangmyŏngsŏng-3 was launched three years ago, on 12 December 2012. It was the first successful launch by North-Korea, in the sense that the payload reached orbit. Whether the payload is operational (as PyongYang claimed), is another question. It's brightness behaviour shows it is tumbling, which is something an operational Earth Reconnaissance satellite should not do. At the time, I did an analysis of the launch-window. It appeared to have been very carefully choosen to avoid coverage of the launch site (and specifically last-minute launch preparations) by Western reconnaissance satellites in the hour before the launch. Interestingly, North-Korea tried to find orbital elements for such Western reconnaissance satellites by looking on this very weblog.